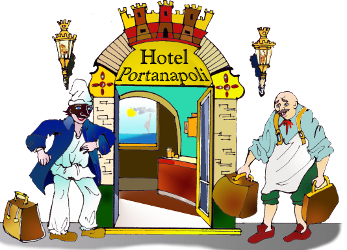 Welcome to hotel.portanapoli.com, the booking portal of www.portanapoli.com - your virtual gate to the Gulf of Naples and the Amalfi coast. Here you can find beautful hotels, Bed & Breakfast, amazing apartments and outstanding villas in Italy. We can offer a wide selection of exklusive five-stars hotels, beautiful beach hotels and pretty Bed&Breakfasts. For useful information about the highlights and landmarks in Campania visit www.portanapoli.com. Discover over hundred pictures in the photo gallery, get information about the weather or the most beautiful spots in Italy.